Children do their most important learning before the age of five. That’s why, in addition to lots of love and attention, everything we do at Kinder Haven involves early childhood development. Through different programs and plans we incorporate a variety of activities and experiences to assist in the learning process. Kinder Haven centres pride themselves on employing qualified early childhood educators and age appropriate facilities and resources to ensure each child is given the best opportunity to develop. At Kinder Haven, the most important part of our job is to make a positive difference to the children’s lives, by providing the very best care and education for them in a safe and nurturing environment. Our ultimate goal at Kinder Haven is to help develop and promote healthy, active children who are strong in mind, body and spirit. If we allow our children to develop at their own rate, offering stimulating, exciting environments and activities that promote confidant, independent thinking children, then we will have set the stage for their future learning. Our philosophy is based on the values of Social Equality, Co-operation, Shared Responsibility, Self-Discipline and Mutual Respect and we use these values to develop the “whole” child. The programs are designed and based on what is important in your child’s life. We always look to and consider the social and cultural values of your family and the community in which you live. We also use our extensive knowledge of Early Childhood Development and incorporate relevant theories of how children learn, when we develop the room programs. Each child is unique; therefore we provide a caring environment to allow for individual development. A combination of both indoor and outdoor environments and flexible routines allow us to develop appropriate learning programs for the children. Teaching children to preserve and conserve the environment is of utmost importance at Kinder Haven. We recycle our drinking water, turn lights on only as required and re-use paper and materials in our pasting and creative activities. Outdoors, at select centres, we plant and care for our vegetable gardens, watch flowers grow, build worm farms and observe the many varieties of bugs and insects in our yards. Our water tanks help to keep our grass green. It is vital for children to develop a sense of responsibility for the environment and we use books, posters, artwork, group time and discussion to encourage a love for our planet. We take great pride in incorporating environmental sustainability into our everyday; children learn about recycling items, growing and eating vegetables and lessening our impact on the planet. 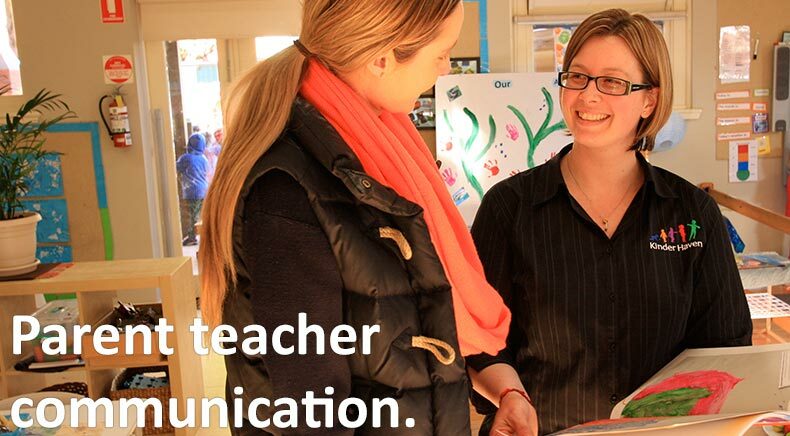 At Kinder Haven, each centres’ curriculum is individually designed based around the Early Years Learning Framework. The Early Years Learning Framework enables childcare professionals to extend and enrich children’s learning, provide opportunities for children to develop a foundation for learning and for children to become successful learners. Within the Framework there are three basic concepts that children’s lives are characterized by Belonging, Being and Becoming. This refers to how a child from even before birth is linked to family, community, culture and place. Through these relationships a child’s development and learning takes place as they begin to explore, develop interests, create their own identity and make meaning to the world around them. When a child has a sense of belonging they are more confident, feel more secure, be more creative and more likely to explore their education. At Kinder Haven, our purpose built centres and resources are designed to create a homelike environment to ensure your child is comfortable. Natural elements and the use of family photos ensure your child feels a sense of belonging at the centre. We aim to have long term educators that you child will bond with and feel comfortable visiting each day. Each centre is also conscious of cultural needs. When a child has a sense of being they build and maintain relationships with others, take part in life’s journey and face challenges in everyday life. At Kinder Haven, we aim to create a sense of being by teaching and showing respect through greetings, conversations and actions. Each centre celebrates that each child is an individual and children learn to respect different cultures and way of life to their own. We also aim to give children the skills to handle and cope with difficult situations they may come across. Within early childhood, a child’s sense of being, changes overtime as they gain knowledge, extend their understandings, create relationships and develop skills. This enables a child to learn to participate actively in today’s society. At Kinder Haven, we aim to create a sense of becoming by preparing children for school and beyond. Kinder Haven has a strong focus on education and life skills to create confident learners. Children also create friendships that they carry through to their school years. 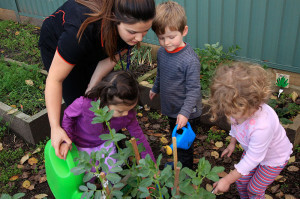 All Kinder Haven centres follow a structured Kindergarten program. All Victorian based Kinder Haven centres have a Kindergarten program supported by the Victorian Government. This means the centres qualified educators, programs, facilities and resources are recognised by the government as providing a high quality service. Thorough our Kindergarten program we aim to provide your child with essential skills and knowledge to ensure they are ready and confident for the next step in their education. At kindergarten your child will learn, develop skills, and play in a safe and happy environment. We have adopted the adage “It takes a village to raise a child,” (African proverb) so we work together with parents to establish and maintain a nurturing environment conducive to learning. Parents are welcomed to discuss and contribute to their child’s developmental program. Parent nights are organised twice a year, and allow for lots of questions, feedback and to generally learn about what’s happening in the room. All Kinder Haven centres have an open door policy for our families and each centre appreciates valuable input regarding the care of your child. We welcome you at any time to drop into the centre and participate or provide feedback on any of our policies and procedures.